I used to be able to bribe my husband to eat a frittata for dinner by serving it with roasted potatoes… unfortunately, that bribe has worn thin. A frittata topped with burrata was an easy sell! 🙂 This dish could be served for any meal of the day. This recipe was adapted from The New York Times, contributed by David Tanis. The burrata brought it to the next level. Next time, I would make half of the pesto. We ate it with roasted potatoes and green salad. Nice. Rinse asparagus, and pat dry. Cut into 1-inch pieces on the diagonal, or into julienne strips if preferred. Set aside. In blender or small food processor, purée olive oil, basil and parsley to make a thin pesto. Season with salt and pepper. Put a 10-inch cast-iron skillet or other nonstick omelet pan over medium-high heat. When hot, add butter and swirl to coat pan, then add asparagus. Season with salt and pepper and cook, stirring for about a minute without browning. Quickly pour in eggs and stir with a wooden spoon, as if making scrambled eggs. Tilt pan and lift mixture at the edges to allow any runny egg from the top to make its way to the bottom. After 3 or 4 minutes, the frittata should be mostly set. Sprinkle with Parmesan cheese. Set whole burrata in the center of frittata. Drizzle with herb pesto. Pierce burrata with tip of a knife and spoon contents over frittata. Cut frittata into wedges and serve directly from pan, garnished with basil leaves. I’m sharing my burrata frittata at Angie’s Fiesta Friday #227 this week, co-hosted by Lizet @Chipa by the Dozen and Jhuls @The Not so Creative Cook. Enjoy! This recipe was adapted from The New York Times, contributed by Florence Fabricant. I used a Trader Joe’s pie crust as a shortcut. I also substituted 2 lobster tails for a whole lobster and used a Vidalia onion and parsley in the filling. Delicious. Heat oven to 425 degrees, preferably on convection. Roll out pastry between layers of plastic wrap or on a lightly floured surface. Fit into a 9-inch straight-sided tart pan or a pie pan. Prick bottom, line with parchment and foil and add pastry weights. Bake 10 minutes, until pastry starts to look dry. Remove foil and weights and bake 5 or so minutes more, until pastry is lightly colored. Remove from oven but leave oven on. While the crust is par-baking, cook the lobster meat. I cooked the lobster tails in boiling, salted water for 8 minutes. (1 minute per ounce- each tail was about 1/2 pound.) When cool enough to handle, cut off the shell and coarsely dice the meat. Melt butter in a saucepan. Add onion and cook on low until soft but not brown, about 5 minutes. Stir in corn, tarragon or parsley and cayenne. Stir in milk. Bring to a simmer. Remove from heat. In a bowl, beat eggs and cream together and slowly stir into the pan. Add lobster. Stir in lemon zest and season with salt and pepper. Ladle mixture into prepared tart shell. Bake 10 minutes. Reduce heat to 350 degrees and bake about 20 minutes more, until top is firm to the touch and very lightly browned, and a knife inserted in the filling comes out clean. I made this galette for myself. I really did- which rarely (read: never) happens. As soon as I saw the recipe I had to make it. Such a seasonal and pretty vegetarian meal. The perfect use for my CSA butternut squash and red onions too. It took me a week to enjoy it and was worth every flavorful bite. The crust was super flaky and fabulous thanks to grating frozen butter into the dry ingredients. Genius. I made the crust days in advance and kept it well wrapped in the refrigerator without any issues as well. This recipe was adapted from Food and Wine, contributed by Justin Chapple. I used all butternut squash instead of a combination of varieties. I also adapted the crust preparation as well as the baking times for a convection oven. Lovely! I am sharing this at Angie’s Fiesta Friday #142 this week, co-hosted by Elaine @foodbod and Michelle @O Blog Off. Enjoy! In a large bowl, whisk the flour with 3/4 teaspoon each of salt and pepper. Working over the bowl, grate the frozen butter on the large holes of a box grater. Gently toss the grated butter in the flour. Stir in 1/3 cup of ice water until the dough is evenly moistened. Scrape out onto a sheet of plastic wrap. Gather up any crumbs and knead gently just until the dough comes together. Pat into a disk, wrap in plastic and refrigerate until chilled, about 1 hour, or up to several days in advance. Preheat the oven to 425°, preferably on convection. On a large rimmed baking sheet, toss the squash and the onion with the olive oil and curry powder. Season generously with salt and pepper. Roast for 15 to 20 minutes, until the squash is tender but not falling apart. Let cool. Increase the oven temperature to 450°. Lightly flour the dough and place between sheets of plastic wrap. Roll out the dough to a 14-inch round. Remove the top layer of plastic wrap and replace with a piece of parchment paper large enough to line a rimmed baking sheet. Invert and carefully transfer to a baking sheet. Spread the sour cream over the dough, leaving a 1 1/2-inch border. Sprinkle 1/4 cup of the cheese on top. Arrange the squash and onion over the sour cream and sprinkle the remaining 1/4 cup of cheese on top. Fold the pastry edge up and over the vegetables to create a 1 1/2-inch border. Bake the squash galette for 25 to 35 minutes, until the crust is browned; let cool slightly. Sprinkle with shredded cheese, cut into wedges and serve warm. Make Ahead: The galette can be made a few hours early and rewarmed before serving. I love all of the greens that I receive in my CSA share. Mixing different greens in the filling of this adaptation of Greek spinach pie, Spanakopita, made it incredibly flavorful. This recipe was adapted from the New York Times, contributed by Martha Rose Shulman. I used one-half pound of spinach in addition to approximately one pound of mixed CSA greens including red chard, beet greens, and kohlrabi greens in the filling. I sautéed the greens instead of boiling them as well. I doubled garlic and the onions, and used one yellow onion and one red onion. Years ago, I made a “low-fat” savory pie with a phyllo pastry crust. The reduced-fat technique was using cooking oil spray between the layers of pastry instead of brushing them with butter or oil. I love it! I used this method when making this pie as well. Great. Stem and slice the greens into ribbons, about 2-inches wide for more tender greens, and 1/2-inch wide for heartier greens. Wash them in 2 changes of water, lifting them from the water so that the dirt stays behind. Thinly slice the chard stems and soak in a bowl of water. Lift from the water like the greens. Preheat the oven to 375ºF, preferably on convection. Oil or butter a 10-inch tart or cake pan (I used cooking spray and a 9-inch ceramic deep pie dish). Heat the olive oil in a large skillet over medium heat and add the onions and rinsed chard stems. Cook, stirring often, until tender but not browned, about 5 minutes. Add the garlic and cook, stirring, for another 30 seconds to a minute, until the garlic is fragrant. Stir in the damp greens. Sauté until wilted, season with salt and pepper. Add the herbs and adjust the seasoning. Remove from heat. Beat the eggs in a large bowl. Crumble in the feta. Add egg-cheese mixture to the greens, mix to combine. Line the pie dish with 7 pieces of phyllo, spraying between each layer with cooking oil spray or lightly brushing each piece with butter or oil and turning the dish after each addition so that the edges of the phyllo drape evenly over the pan. Using a slotted spoon, fill with the greens mixture. Fold the draped edges in over the filling, lightly brushing the folded in sheets of phyllo, then layer the remaining 5 pieces on top, brushing each piece with cooking spray, butter or olive oil. Trim the edges and then stuff into the sides of the pan. Make a few slashes in the top crust so that steam can escape as the pie bakes. Bake 40 to 50 minutes in the preheated oven, until the crust is golden. Serve hot, warm, or room temperature. I have a new favorite appetizer!! Perfect for any holiday or game day. It is quick to prepare and absolutely delicious- pretty too! This recipe was adapted from Food and Wine, contributed by Laura Chenel. I made it to serve at our second annual Christmas concert where my kids and their friends perform for my friends, my husband, and me (aka their parents and grandparents!). This year we had many pianists, two cellists and a French horn player. The kids all did a great job, of course. It is quite a festive event! It was so warm this year we were able to have a glass of wine by the fire outside afterwards- so lovely! I’m going to bring this deliciousness to share with my friends at my favorite blog party Fiesta Friday #102! (once again… better late than never!) This week two of my buddies are co-hosting the fun- Elaine @foodbod and Julie @Hostess at Heart. 🙂 Enjoy!! Preheat the oven to 475° preferably on convection. On a lightly floured surface, roll out the pastry to a 13-inch square. 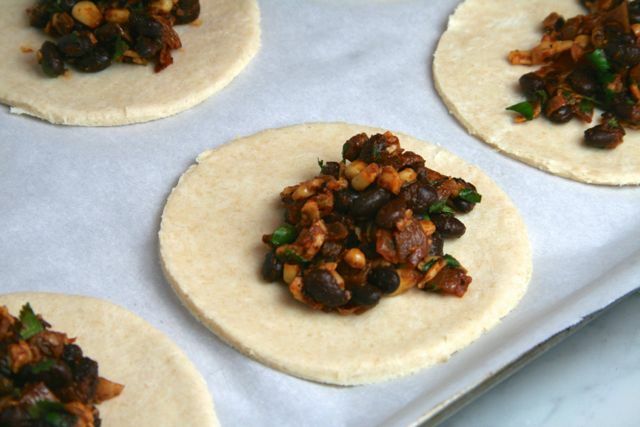 Fold the corners in and lightly roll the pastry into a rough round. Transfer to a baking sheet; refrigerate. In a large skillet, heat the olive oil until shimmering. Add the leeks and thyme, season with salt and pepper and cook over moderate heat, stirring occasionally, until softened, about 5 minutes. Sprinkle half of the cheese over the pastry, leaving a 1-inch border. Spread the leeks over the cheese. Cover with the prosciutto; sprinkle on the remaining cheese. Season with salt and pepper. Fold up the tart edge to form a rim and bake for 17 to 20 minutes, until golden and bubbling. Blot any excess fat with a paper towel. Cut the tart into wedges and serve. This crostata was worth every bit of effort. The crust was perfectly flaky. 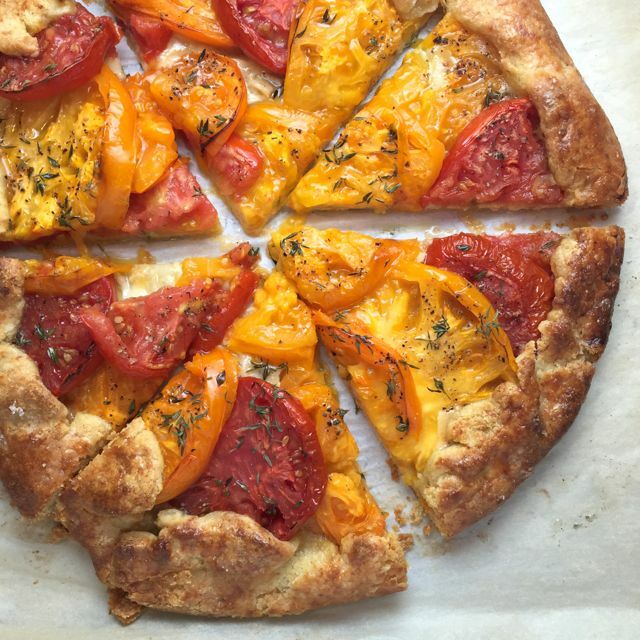 The sweetness of the tomatoes was enhanced by the honey-thyme-vinegar glaze. The garlic oil, gruyere, and thyme added layers of wonderful flavor. Delicious! This recipe was adapted from The New York Times, contributed by Melissa Clark. 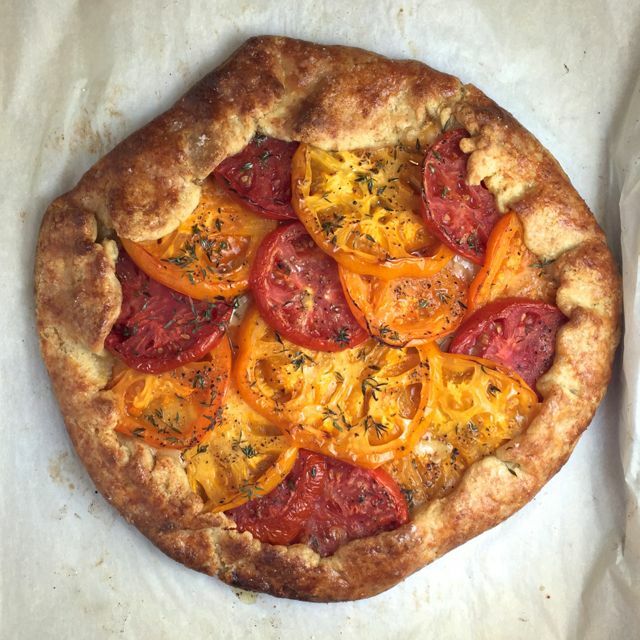 I used a combination of my CSA and colorful heirloom tomatoes, used gruyere instead of cheddar, and reduced the baking time for a convection oven. I am sharing this special dish with my friends at Fiesta Friday #84 this week hosted by Steffi @ Ginger and Bread and Effie @ Food Daydreaming. Enjoy!! In a food processor, briefly pulse together flour, cornmeal and salt. Add butter and cheese and pulse until mixture forms chickpea-size pieces (3 to 5 one-second pulses). Add ice water 1 tablespoon at a time, up to 6 tablespoons, pulsing occasionally until mixture is just moist enough to hold together. Meanwhile, line a rimmed baking sheet with a double layer of paper towels. Spread out tomato slices in a single layer. Sprinkle with 1 teaspoon salt and let sit for at least 1 hour and up to 3 hours. In a skillet over medium heat, combine vinegar, honey and thyme sprigs and bring to a simmer; let simmer 2 minutes, then transfer to a bowl. Wipe out skillet, then add olive oil and garlic. Cook garlic for 2 to 3 minutes, or until garlic is golden and caramelized. Remove garlic and finely chop. Reserve garlic oil. Heat oven to 425 degrees. Pat tomatoes dry with paper towels. Brush tomatoes with honey mixture. Leaving a 3-inch border, distribute the garlic, then the cheese, followed by half the chopped thyme leaves on center of crust. Add black pepper to taste, then layer tomatoes in an overlapping pattern, maintaining the 3-inch border. Drizzle garlic oil over tomatoes, sprinkle with remaining thyme leaves. 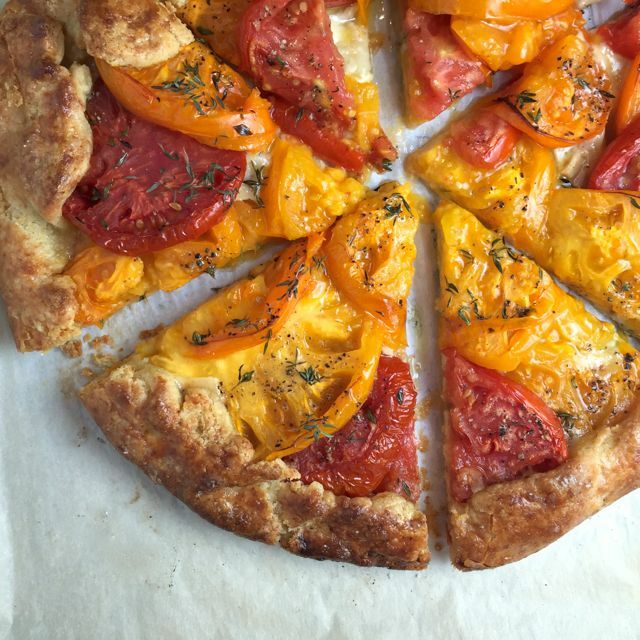 Gently fold crust up around tomatoes, making a 2-inch border. In a small bowl, whisk egg and 1 teaspoon water. Using a pastry brush, brush egg wash over crust and sprinkle top of crostata with flaky salt. Bake for about 25 minutes on convection, or up to 35 minutes in a standard oven, until pastry is deeply golden brown. Serve warm or at room temperature. I was originally going to combine my two vegetarian empanada posts… but that would be such a disservice to their fabulously different flavors! 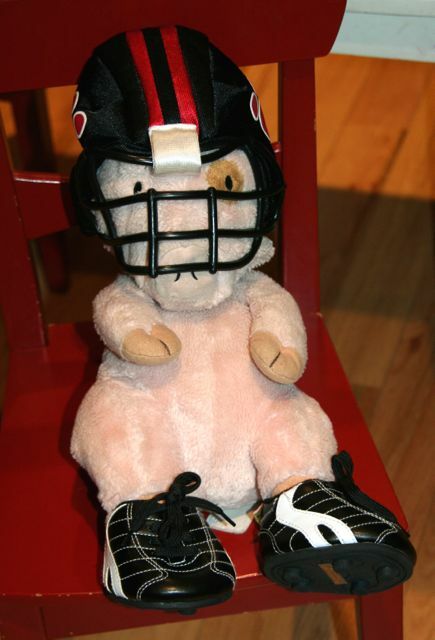 My daughter’s special pig “Honey Pie” – another football fan in our house! If you read my last post, you know how obsessed I am with empanadas- and so you know what a super-special Super Bowl meal this really was!! 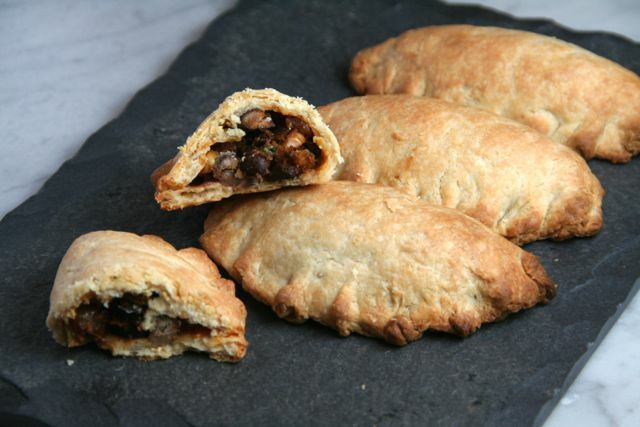 These black bean empanadas were the second vegetarian empanada version we had for the big game. This filling had a really creamy texture and a spicy bite that held up well to the dough. Great. I cut the dough into 5-inch circles, and we ate the empanadas as a main course with refried beans and brown Basmati rice. (We had chips and guacamole first, of course!!) If the dough is cut into 3-inch rounds, they would be the perfect size for an appetizer. This recipe was adapted from Carla’s Comfort Foods: Favorite Dishes from Around the World by Carla Hall with Genevieve Ko. I also adapted the baking time to use a convection oven. I am bringing these tasty morsels to share with my friends at Fiesta Friday #54 over at The Novice Gardener. I am co-hosting this week with my friend Sonal of Simply Vegetarian 777. So exciting!! Join the fun- it is a great way to meet other bloggers and increase the exposure of your own blog! Click here for the guidelines to join the party. Make the Dough: In the bowl of a stand mixer, mix the flours and salt. With your hands, toss the butter and cream cheese in the flour mixture until each piece is lightly coated. With the paddle attachment, beat on low-speed until the dough comes together and forms a loose mass around the paddle. Make the Filling: In a small bowl, cover the raisins with the hot water. Let soak. Heat the oil in a large skillet over medium heat. Add the onion, garlic, 1/2 tsp salt, and 1/4 tsp pepper. Cook, stirring occasionally, until the onion just starts to turn translucent, about 3 minutes. Add the ground chiles and cook, stirring, about 1 minute. Add the tomato paste and cook, stirring, for 2 minutes. Stir in the beans, corn, and raisins with their soaking liquid. Bring to a boil, then reduce the heat and simmer for 5 minutes. Remove from heat and cool completely. When cool, stir in the cheese and cilantro. Preheat the oven to 400°. Line 2 large baking sheets with parchment paper. To Finish: On a floured work surface (or between layers of plastic wrap), roll out the dough 1/8 inch thick. Using a 5-inch round cutter (I used a bowl), cut 9 rounds out of the dough, reshaping and re-rolling out the dough as necessary. 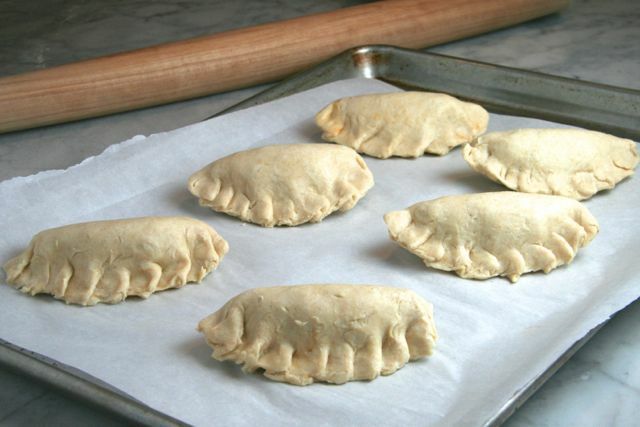 Arrange the empanadas on the prepared baking sheets and bake in the upper and lower thirds of the oven for about 20 minutes (on convection) or up to 30 minutes in a standard oven, until browned and heated through. 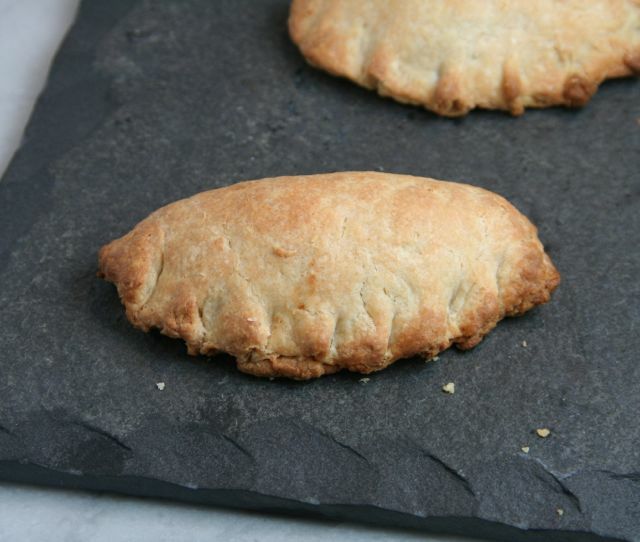 Serve the empanadas warm or at room temperature.